I suppose I shouldn't be surprised that the Irish Anti War Movement have released the following statement condemning the allied intervention in Libya. 1. NATO bombing, no solution. Just eight years after they launched their shock-and-awe devastation of Baghdad and ten years after their invasion of Afghanistan, the same Western forces are pummelling yet another Muslim state with bombs, burning soldiers and tanks and killing civilians in the process. Yet again, the claim is that their intervention is a question of moral principle. The passing of the UN security Resolution 1973 which authorised the bombing, was held up as an attempt to protect the Libyan rebels and stop Gaddafi brutally slaughtering his people. 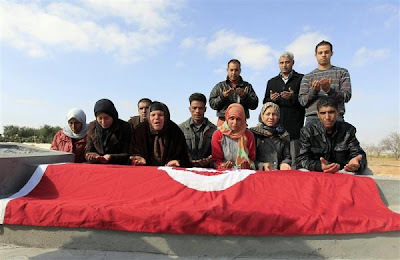 Why, then, did the same Western powers provide Gaddaffi with the arms that are now slaughtering the Libyan people? Had NATO and the UN really wanted to support and protect the rebels, they could have acted differently. They could have sent arms directly to the rebels and dispatched anti-aircraft weaponry to Benghazi, Alzentan and Zintan, near the Tunisian border, and dropped weaponry and supplies to the rebels besieged in Ajdabiya and Misrata. They could have offered medical help and followed the example of many Libyan doctors in exile who hastened home to offer help to the injured. They could have simply united in recognising the Benghazi based National Council as the legitimate government of Libya. So where lies the justification for the intervention? With 39.1 billion barrels of high quality oil reserves, and with the price of oil rising above $105 per barrel, western oil companies are keen to maintain their access to the Lybian oil fields. BP has huge investments there, but Italy and Spain are large buyers of Libyan oil, and most major European companies operate in Libya, including Spain's Repsol, Italy’s Eni, France's Total, Germany's Wintershall and Austria's OMV. As with Iraq, we cannot ignore that the question of oil looms large in this military intervention. 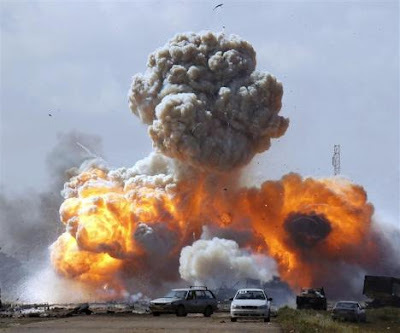 The NATO bombing has failed to halt the fighting or force Gadaffi’s forces into submission. It is actually making things worse. This is why even the dictator dominated Arab League have said that the bombing has gone well beyond a no-fly zone from the outset. The African Union has condemned the bombing as unjustified intervention in a civil war. These misgivings led Russia China Brazil, Germany and India to abstain in the original UN vote. Even in Britain, despite it being the first days of the military campaign, 43% of the population have already said they are against the action. The IAWM, too, calls for an immediate end to the bombing. Read the rest of the article, and it gets much worse, here. If you want my view on how everything in the above piece is nonsense, read my previous posts on how it could have been like the Iraqi rising in 1991 and how it's not about oil. I was naive if I thought just for one moment, that the far left would give NATO the benefit of the doubt that they were doing the right thing. Even though the citizens of Benghazi were 24 hours away from being massacred before the intervention, the IAWM still seem fit to blame capitalism and oil. But the truth is the Irish Anti War Movement is in fact an anti capitalist organisation that disguises its real agenda in criticism of the foreign policies of western countries. In fact, it is not even an anti war. The IAWM oppose the Israeli Palestinian peace process and as I understand it have called for the pro western regimes to be overthrown so that they can join in the struggle against Israel, not exactly my interpretation of being anti war. At this stage, just like Gadaffi, anything the IAWM have to say on the conflict is completely meaningless. President Obama gave an excellent speech last night. His base will not like it but Obama is convincing and most will give him the benefit of the doubt. Conservatives that have been calling him weak on National Security since 2008 will struggle to take a position on this. You can expect to see a far less than a unified approach to this from the Republican Party. Although in characteristic non partisan fashion, John McCain, my favourite Republican did praise the President's speech. Watch Obama speaking below. Events of a monumental nature are currently taking place in the Middle East. 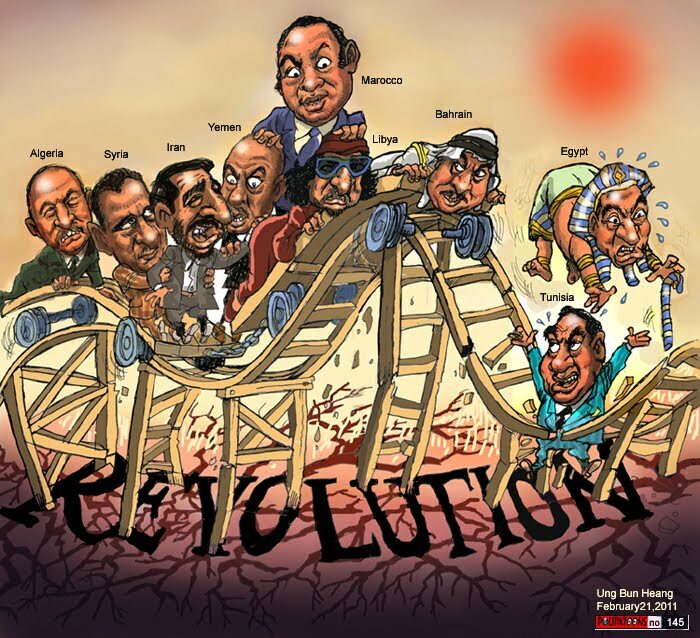 Authoritarian regimes have been overthrown in Tunisia and Egypt. We don't yet know what will replace these regimes. In Libya, Colonel Gadaffi's despotic regime is fighting for its life amid rebel advances and NATO air strikes. 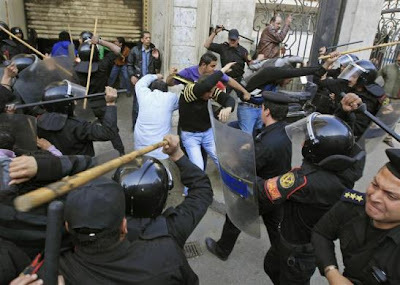 And there is violent unrest in several other Arab nations. I want to look at some of these cases and try to analyse what the general picture might be in region when its all over. 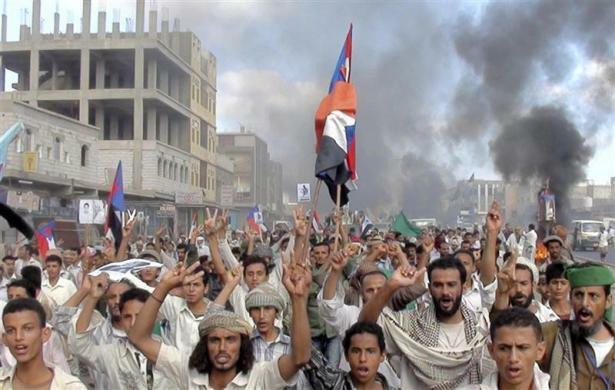 President Ali Abdullah Saleh has ruled Yemen as a united country since 1990. He previously ruled North Yemen from 1978 to 1990. His dictatorial regime is coming apart as we speak. On Friday 18th March government forces opened fire on demonstrators in the capital Saana killing 46 people. I believe that Yemen, of all the countries currently facing unrest, is the nation most likely to be replaced by an extremist element in the event of regime change. I say this even though I must confess it is the country in the Middle East I understand least. It is clear however that it is the poorest country in the region whose complex tribal and religious fault lines are heavily influenced by fundamentalist Islam. I was shocked when the UAE and Saudi Arabia sent troops to Bahrain to help supress the unrest. 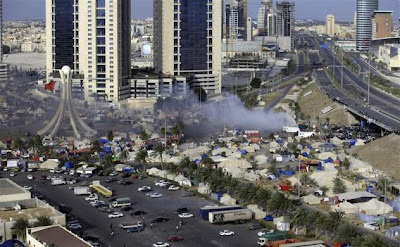 However it was clear that this as done to send a signal to Iran, stop stirring trouble among the Shiites in Bahrain. Incidentally, I am sure that UAE participation in such an action could never have taken place prior to the Abu Dhabi bail out of Dubai, something I blogged about here and here. The sectarian nature of the Bahraini state obviously makes this case different that the others and whatever happens in Bahrain it will be played out in the context of the wider Sunni Shia power struggle over which sect dominates the Gulf. Bashar Al Assad has ruled Syria since 2000 when he assumed the Presidency upon his fathers (Hafez) death, who himself had ruled Syria for thirty years. Bashar is a young man. It is clear he intends to rule Syria for many more decades. But Syria's masses of disaffected young have made it very clear that they do not intend to stand idly by and allow Bashar and his inner circle of army generals and corrupt regime officials to rule the nation indefinitely. Syria is going to end one of two ways as far as I see it. Either the Assad dictatorship will be forced to go or the regime will succeed in crushing the uprising, just as Assad senior did in the town of Hama in 1982. If the latter happens it will result in the isolation of Syria internationally to such an extent that Assad will probably be forced to step down anyway. Make no mistake, Syria is at such a cross roads. At least 55 people have been killed by the security forces last week in the town of Deraa. There is no doubt, it will soon spread to Damascus. The western democratic world has been presented with a truly amazing opportunity. Look, I know many people, particularly on the right, are sceptical that any real democratic transition will occur in the Arab world. But this is an opportunity that simply cannot be ignored or dismissed in cynicism. 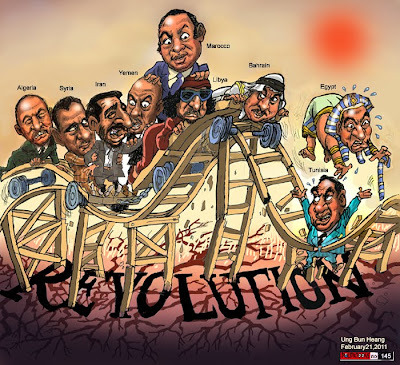 The world has been plagued by the knock on effects of instability and dictatorship in the Middle East for generations. An opportunity has fallen on the lap of President Obama in particular to encourage and influence change that is so fundamental, we could ultimately be looking at a Middle East that is democratic and at peace with Israel. To put it simply, the options cannot just be between an iron man or and Islamist government. There must be a third way. A way that accommodates the cultural and religious characteristics of an Arab state making them compatible with democracy. President Obama, has to, absolutely must nourish a third way by engaging with the opposition movements at political and religious levels to help them formulate an Arab model that is more representative of the people and less troublesome for the world. The day of the hard man, the cartoon character or the monarch ruling for decades is coming to an end. It must be replaced by by an Islamic form of democracy. I hope Obama has a plan. The Arab Spring is showing no signs of burning itself out. Quite the opposite in fact, It continues to spread.Here are some photos which speak for themselves. For the cynics who say that this latest intervention in Libya is only about selfish western capitalist interests, I suggest they watch this video below posted by Gary in his excellent post comparing the uprising in Libya with the Iraqi uprising of 1991. The harrowing video shows rare footage of the Shia uprisings in Karbala, Basra and Najaf that followed Saddam Hussein's defeat in the first Gulf War. The unimaginable terror that grips these cities when they are surrounded by Saddam's Republican Guard as he prepares to enact his revenge on his disloyal subjects is truly spine chilling. It is very important to remember that last Friday, Colonel Gadaffi's forces were 24 hours away from retaking Benghazi where upon they would have inflicted a similar revenge to that of Saddam in 1991. And make no mistake, he would have. You do not seize control of a massive oil rich nation like Libya, at age 27 and hold it for 41 years without having a capacity for cruelty so intense that regular people could not possibly imagine it. The allies did the right thing. Oil, double standards, hypocrisy, these are the terms being thrown around by opponents of this latest intervention by NATO countries in the middle East. The standard response from the left can be summarise by George Galloway on Sky News yesterday. Lets look at the main points being argued by Galloway and others. 1. This is about oil. The problem with that argument is simple. Gadaffi was cooperating in this respect. He was playing ball. He had been pumping oil and gas to the west ever since Tony Blair " brought him in from the cold" five years ago. If stability and keeping the oil flowing was the objective then Britain, France and the US would have left him alone to slaughter his people. 2.This is not about protecting civilians. On Friday, Gadaffi's forces were 24 hours away from retaking Benghazi and putting and end to the uprising. In doing so Gadaffi would have without question murdered thousands of those who opposed him. If the west had not intervened this clearly would have happened and the left would be screaming hypocrisy for not taking action for the sake of stability. People would be saying, for years the west has been talking about democracy in the Middle East but when the Libyan people rebelled against tyranny, we stood by and allowed it to be crushed just to keep the oil flowing. Cameron, Sarkozy and Obama refused to let this happen. 3. Why is Libya different that the others ? 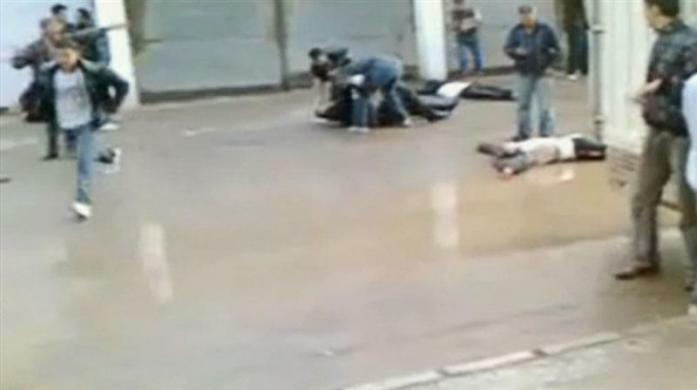 Firstly, I think the violence in Libya has been worse than anywhere else. Secondly Libya has a 500km Mediterranean coastline which also borders Europe making it in Europe's strategic interests to deal with. Thirdly, Gadaffi is a vengeful, unpredictable mad man who has blown civilian air craft out of the sky in the past and would likely do it again if he were to survive. But simply put, as David Cameron said, just because you can't intervene everywhere when it is right to do so does not mean you should not intervene anywhere. 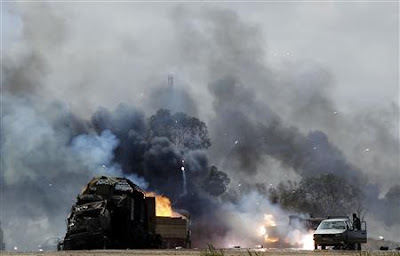 A convoy of pro Gadaffi troops is destroyed from the air, likely by French Air Craft. Sky News are reporting that the French Air Force have already engaged and destroyed ground vehicles in Gadaffi's army. Today's fast moving events which came in response to yesterdays offer of a ceasefire by Gadaffi can be summarised by the following Reuters article. Allied warplanes have gone into in action to stop Libyan leader Muammar Gaddafi's forces attacking the rebel-held city of Benghazi, French President Nicolas Sarkozy said on Saturday. Gaddafi's troops on Saturday morning pushed into the outskirts of Benghazi, a city of 670,000 people, in an apparent attempt to pre-empt Western military intervention expected after a meeting of Western and Arab leaders in Paris. But as the meeting ended, Sarkozy announced that allied air forces had already gone into action. "It's a grave decision we've had to take," Sarkozy said after meeting British Prime Minister David Cameron, U.S. Secretary of State Hillary Clinton and other leaders in Paris. "Along with our Arab, European and North American partners, France has decided to play its part before history." Sarkozy said of the meeting: "Those taking part agreed to put in place all necessary means, especially military, to enforce the decisions of the United Nations Security Council. "This is why, in agreement with our partners, our air forces will counter any aggression by Colonel Gaddafi's aircraft against the population of Benghazi," he said. "As of now, other French aircraft are ready to intervene against armored vehicles which threaten unarmed civilians." Military action could be halted at any time if Gaddafi stopped his forces attacking, Sarkozy said. "Colonel Gaddafi has made this happen," British Prime Minister David Cameron told reporters after the meeting. "He has lied to the international community, he has promised a ceasefire, he has broken that ceasefire ... We cannot allow the slaughter of civilians to continue." I think this is a good thing. Colonel Gadaffi seized control of Libya 12 years before I was born. He has messed with just about everyone since then and has brutally suppressed domestic opposition. Just think about it, how rare is it to get the UN security council to sanction military action. Furthermore how unusual is it to see the 22 member Arab League unanimously back action against a fellow member. 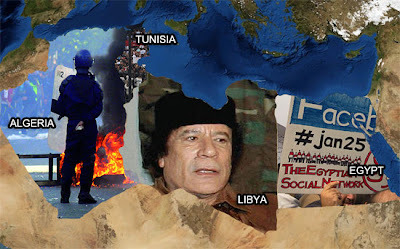 Gadaffi has created so many enemies over the decades it has finally caught up with him. Many dictators die fat old rich men. Many other die in exile. I find it very satisfying to know that Gadaffi's end will occur at a time and a place not of his choosing. But most importantly, this action by the allies will insure that the reform spreading across the Middle East will continue. Had Gadaffi succeeded in retaking Benghazi, it would have been a permit for the butchers in Yemen, Syria and elsewhere to crush their opposition movements. Bravo Cameron, Sarkozy and Obama. It's a funny old world we are living in. 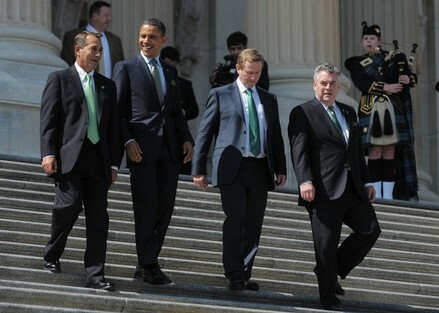 I opened the Irish Independent today and saw this picture of House majority leader John Boehner, President Obama, Taoiseach Enda Kenny, and congressman Peter King. Congressman King, a New York Republican is currently in the news because he is leading the controversial congressional hearings into the radicalisation of American Muslims which many are calling McCarthy like. The thing is, Congressman King was an active supporter of the Provisional IRA which he called the "legitimate voice of occupied Ireland." King was personally very close to the IRA leadership, and not just Gerry Adams and the likes. He maintained close contact with IRA commander Michael McKevitt (among many others), who subsequently expressed his opposition to the Good Friday Agreement in 1998 by slaughtering 31 innocents in Omagh. McKevitt (now a leading dissident Republican) was also the man who initiated the IRA's relationship with Colonel Gadaffi who would arm the IRA for much of the 80's, and whose 40 year regime only yesterday had its fate sealed by President Obama when he effective authorised a no fly zone over Libya. During the 80's King was forbidden from appearing on British TV or radio. He not only infuriated the British authorities with his support for IRA terrorism, he also angered the Irish government. The Gareth Fitzgerald led Fine Gael government (1983-87) of which Enda Kenny was a member, was the first Irish government that actively opposed the IRA campaign. In 1985 the Irish government boycotted the St Patricks Day parade in New York because its Grand Marshal was IRA supporter Peter King. It is indeed a strange twist to watch Peter King walk down the steps of Capitol Hill with the Taoiseach, considering Kenny's government once called King an "avowed" supporter of terrorism, at a time when King is now claiming that Mosque's which contain "Palestinian Paraphernalia" are becoming radicalised and potentially supporting terrorism. I can't help wonder if yesterday, this tapestry of events came up in conversation as Kenny, Obama and King chatted in private. Happy St Patrick's day to one and all. 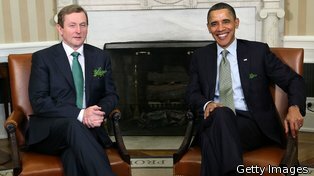 Today, our new Taoiseach met with President Obama in Washington DC. The two men held a half hour meeting in the Oval office where I'm sure the global economy was the main topic of conversation. However, as Ireland celebrates its national day and as kenny and Obama chatted so cosily, the situation in Libya is on a knife edge. 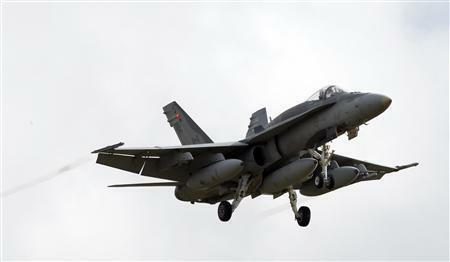 A decision has to be made in the next few hours as to whether or not a no fly zone should be enforced over Libya. 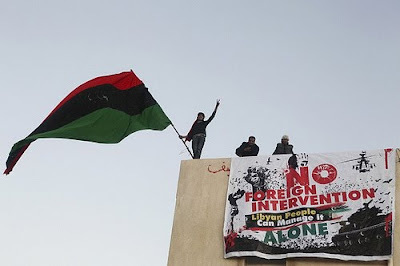 If the Libyan air force is not challenged by NATO, them the rebels will be defeated and the Gadaffi regime will survive. This will be followed by the slaughter of those who demonstrated against him, particularly in the eastern city of Benghazi. But most importantly of all, Gadaffi's survival will signal an end to the unrest that has swept the region in recent months. The west should not leave this psychotic vengeful man in power. They should enforce a no fly zone, destroy his air force and allow the rebels to march on Tripoli. Realpolitik suggests that you sometimes have to do unpleasant things for the greater good, in this case the greater good is keeping the oil flowing in the Middle East. The problem with realpolitik is that it can be used to justify just about anything. Just listen to General Buck Turgidson explain why the US should launch a nuclear attack against Russia, it is very convincing. No doubt just prior to Obama's meeting with the Taoiseach he was informed of the latest events in Libya. And no doubt he received an update just as it ended. The meeting may even have been interrupted with an update as events are moving so fast and time is so critical. If President Obama does not act and he allows Gadaffi to remain in power he will go down big time in my estimation. I hope he has the courage to do the right thing and rid the Middle East and the world of a tyrant. Now, please enjoy the amazing voice of the late Luke Kelly as he sings one of my favourite songs,"a song for Ireland". And now, enjoy a truly classic version of Danny Boy from the Mupppets. 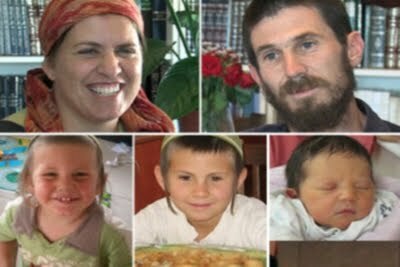 Five members of the Fogel family were brutally murdered last Friday. Last Friday night one or perhaps more West Bank Palestinians infiltrated the Jewish settlement of Itamar and committed a particularly grisly murder that Charles Manson would be proud of. They knifed to death Udi Fogel (36) and his wife Ruth (35). They then slashed the throats of their 11 year old son Yoav and their 3 month old baby girl Hadas. They then turned their attention to 3 year old boy Elad who they stabbed in the heart twice. Several things went through my head when I first heard about this story. Firstly I thought, all politics aside, what kind of person can stab an infant to death. The answer is only two types, someone who is criminally insane and someone who is completely consumed by evil. As this was not a random act the man or men who did this clearly fall into the latter category. Other thoughts which entered my head were as follows. I know that in conflict zones there is extreme hatred and savagery. I have known this since I was 13 upon hearing the news that loyalist terrorists had machine gunned the local pub in a Catholic part of Co Derry near where my mother is from, killing eight civilians. But there was something truly exceptional about these West Bank murders. People who hate the other side or are upset about land being stolen normally plant bombs or launch ambushes. They may even attack civilians. But butchering the children of the enemy (as in this picture) is different. In this case it is about sheer unmitigated hatred of the Jew. It must be face up to that for some Palestinians, I hope a minority, the Israeli Palestinian conflict is not about settlements, borders or refugees. It is about killing the Jewish enemy. 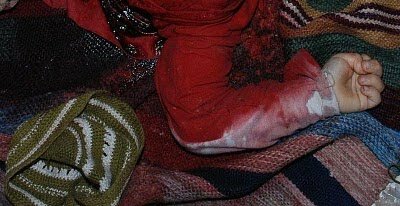 And finally, a feeling of guilt came over me on hearing the news because a few months back I wrote this blog post about how different sides in conflict zones use civilian and civilian casualties for propaganda purposes and even deliberately put their citizens in harms way for this reason. I accused Hamas, Hezbollah and West Bank settlers of this tactic. I am prepared to stand by the argument I made in that post even though I do so reluctantly after Friday's massacre. But I will say this. One of the reasons I stand by my previous argument is that I know that the Israeli response to this atrocity will be to build more Jewish settlements in the West Bank. This would be a mistake because it will eventually mean war and it will be a war with more civilians in the front line. AN advance party of Irish peacekeeping troops is expected to be deployed in south Lebanon next month, writes Tom Brady. New Justice and Defence Minister Alan Shatter said yesterday he expected Dail approval for involvement in the United Nations mission there to be granted. Deployment has already met with the backing of the UN and the Government but needs the approval of the Dail. 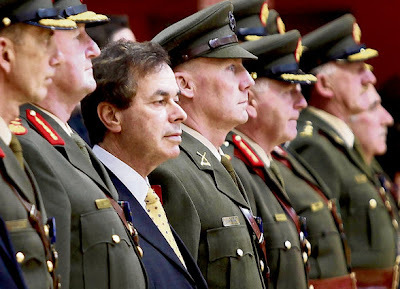 Mr Shatter, who was at a commissioning ceremony for 31 cadets from the Defence Forces at the Curragh, Co Kildare, yesterday, said Ireland had an extraordinary role in peacekeeping operations and it was a tradition that should be continued. Asked if his support of Israel over the years was at odds with the deployment of the troops in Lebanon, Mr Shatter said he had spoken in support of a peace process and resolution of the enormous difficulties that were ongoing between the Israelis and the Palestinians. Of course Alan Shatter knows his job well and protecting the Irish Defence Forces will always be his priority. But he will be in a difficult position if lets say one day members of the Irish Army are killed in an accidental exchange of fire with Israeli soldiers on the Lebanese border. In any event I have no doubt that his history of supporting Israel will be raised again and again particularly in relation to this upcoming Lebanon mission. It will no doubt also be raised by Hezbollah at the first sign of a dispute between them and the UN mission. Wherever the abuse comes from, Deputy Shatter will have to remain firm in the face of claims of bias. Former British Prime Minister John Major has claimed that the events currently unfolding in the Middle East will prove as momentous as those which occurred in Eastern Europe twenty years ago. Watch this clip below from Sky News. It is a sound analysis by Major. Even though I must confess I fear that where as it was in the interest of the western powers to see the fall of Europe's Marxist dictators, there may now be a reluctance to promote further unrest in the Middle East given the global economic crisis. And if the western world does take this view for fear of sky rocketing oil prices, we will regret it because an opportunity like this, to democratise the Arab world may never come again. The solution ? Energy independence. During his time as Secretary of Defence (2001-06) he avoided the O'Reilly Factor at all costs but I suppose when you're plugging a book there is no better place to be. Watch as O'Reilly questions Rumsfeld about the current situation in Libya and the controversial issues during his time at the Pentagon. So Andy Choudary intends on travelling to the US this week to protest outside the White House, a house which "will one day have the Islamic flag flying over it". I really really want to see this comedy act so America please please, let him in. I heard about this interview today, I heard it was bizarre, but when I sat down to watch it on line I was stunned. Gadaffi, who sporadically bursts into English when he gets excited, is certifiably insane. I think it was Winston Churchill's greatest quote when he said, "Dictators are always riding on the backs of tigers (ie their People) and they dare not dismount". Gadaffi is days away from falling off the back of the tiger. When he does, he will be eaten alive and ripped apart, Mussolini style. Watch as brilliant BBC journalist Jeremy Bowen interviews the mad man of the Mediterranean.